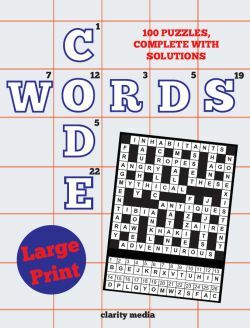 All our large print codeword puzzles not only have large grids that are very easy to read, but most importantly of all the numbers within the grids are very easy to read. They use 16pt font, which means that they are very readable - sometimes you might have seen larger grids but still with small numbers in: that's not the case here! Solving these puzzles is the same as with standard sized puzzles: use the letters given at the start to get the ball rolling. If you hit a roadblock, study the patterns of the numbers and try and make more deductions. Remember that the numbers that you see the most frequently in the grid are almost certainly the most frequently used letters in English: these are, in order, E, T, A: so the most common number is almost certainly one of those. Also look for patterns where perhaps you have a number a couple of times in a row or even several times in a word: for instance 19,19,24,25: how many words can you think of that start with a double letter? At the very least, does this rule out all the consonants? 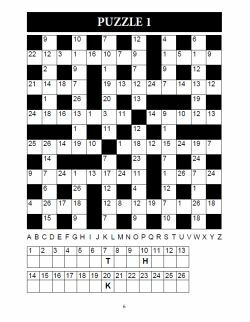 Have a think about this sort of thing and you can often make progress with even tricky codeword puzzles. As for the words in the puzzles, you won't need multi-word answers or phrases. And you won't even need proper nouns, beyond the names of countries - all the rest are standard dictionary words, so you won't be struggling to find brands that you haven't heard of or strange multi-word answers as you might find in some codeword puzzles. Enjoy the puzzles!